Hello! I'm Mic Knight. I'm a Visual Arts Individual trained and skilled in contemporary and historical visual arts production. 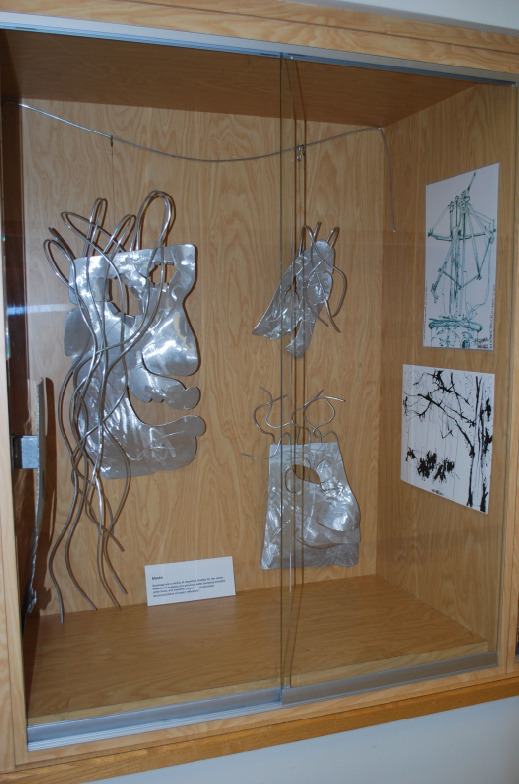 My specialties include Sculpture fabricated in welded aluminum materials, "found objects" constructions in all media possible, steel metal welding & fabricating, paintings, performance, video moving images, and collaborative efforts. Thank you for visiting me here. I'm a student of the human psychology of how we see, what we see, and what we make in the material world. I feel moved by the mechanical arrangement of our lives and the influences which direct our quality of life. My works place myself at the center, viewing the mechanical devices I see every day as if they are dimensional studies of our culture. I am constantly intrigued by the vast number of mechanical devices that human beings build, and see daily, but never perceive as art. To my perception, power lines and power grids are the most imposing sculptures. I experience them as metaphorical works that reference the energy of human relationships. The electrical energy moves about through wires, intersecting, merging, jumping over and bypassing, just as the life force moves about through human beings, intersecting, merging and bypassing to create the amazing panoply of human drama. My working materials are basic and straight forward. 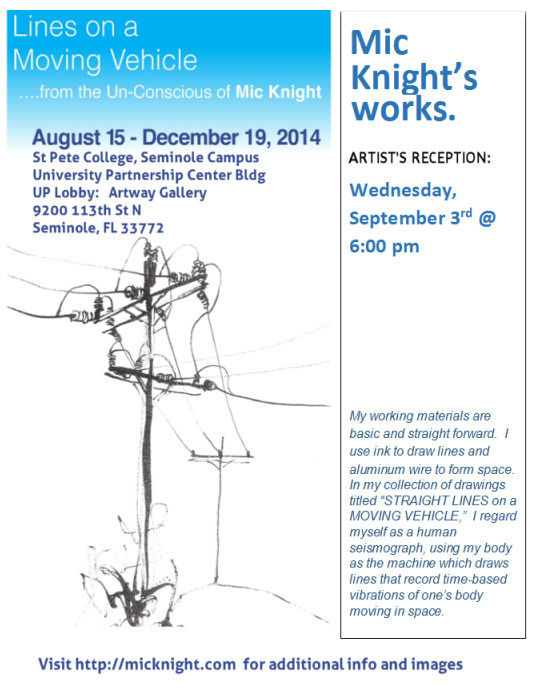 I use ink to draw lines, wire to form space. In my collection of drawings titled Lines On A Moving Vehicle, I regard myself as a human seismograph, using my body as the machine which draws lines that record time-based vibrations of a body moving in space. Below are a few of the works from my exhibit Lines On A Moving Vehicle, held 2014 at the St. Petersburg College Artway Gallery. More works from this exhibit can be seen on my "Exhibits" page on this site. My academic studies have always focused on mechanics of some sorts. In school I was attracted to mechanical drawing classes. In college I studied chemistry and drew molecules and understood translating molecular compositions into visually drawn notes. My later academic studies in the fine arts took advantage of my ability to understand multi-dimensional ideas about the mechanics of energy. Learning about Richard Serra's giant steel slabs as sculpture was a transformational point for me. Edward Kienholz' installations of wire antenna and electronic radios to portray the challenge of listening from East Germany to the free world through the censored war days had a powerful impact on me. A third artist that impacted on me was Judy Pfaff, with her wildly configured mixed media sculptures. One of my earliest memories is the view from the back seat of the family car as we traveled on a vacation. Dad had built a flat platform across the back seat for us kids. I remember lying down, looking up out the wide, back window and focusing on the continuous electric power lines moving through the window frame, up/down, up/down, up/down and wires drooping and crisscrossing from pole to pole. Little did I know this was a conceptual, dimensional thinking process that would fascinate me my whole life.